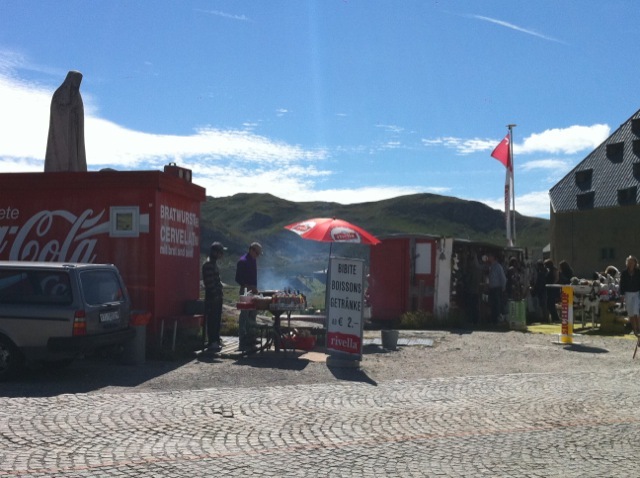 It seems a world away from the classy tourist trap of Lucerne up here at the Gotthard pass. It’s more in line with what you find at Land’s End or even Stone Henge. There is a museum which, if it were free I would have wandered round but as the first exhibit which you could see just beyond the entrance desk consisted of some waxwork figures of the first people to cross the Alps complete with animal skins, I thought I’d give it a miss. There is enough amusement outside watching their modem day equivalents. There was an horrendously loud Italian-speaking woman until a few moments ago. She was, between sentences noshing on a bratwurst sausage that you can buy from the painted shipping container – the one on the left in the picture. You may notice how it is carefully placed just in front of a praying Virgin Mary. Nice touch. The sensory impact of the sausage stall doesn’t stop at the visual; it is also possible to smell the wood burning barbecue (not actually too unpleasant) as well as listening to an eclectic mix of elevator music blaring from some speakers. Beyond the sausages, you may be able to make out a souvenir stall specialising in stuffed St. Bernard dogs of every possible size. Surely they have got the wrong pass, no? That said, there probably isn’t much of a market for stuffed St. Gotthards. To the left of the picture there is a cheese stall. I’m not sure whether the guy looking after it is trying to sell the stuff or is simply trying to get it smoked on the cheap from the sausage van. To the right is a collection of buildings; one houses the museum and a cafeteria, the other a hotel and restaurant. I did think about spending the night up here but having seen the place, I no more want to sleep up here than I want to spend a night in Blackpool. There is a very large White tent and a wooden staircase leading up to a rock with a mule and what I assume to be St. Gotthard himself. I’ll investigate in a few moments. So all that is left to do today is sit back and let gravity do the work as I descend first to Airolo and then to Bellinzona where there is a campsite. At least the scenery up here is spectacular.